With discussion on the beach scene, time to revisit this one methinks (last time was 2009). Some great stuff these folk like, judging by what they post on youtube etc. Anyone know do they have venues or is it just listening music? Are there local radio shows featuring this stuff in LA for example? Why do these tough guys take time out from shooting each other to dig old soul music? How did this scene start? There was a book I helped distribute over here about 10 years ago all about this scene Steve, unfortunately muggins here forgot to keep a copy for himself, someone will know though. I went to a couple of parties in the mid 90's and was blown away by some of the tunes these badass gangsters were listening to. I didn't hang around too long though as there's a lot of difference between a party in South Central and the Jim Wray lounge at Yarmouth! The folk on that scene, that I've encountered, people such as Tommy Siqueiro, Arlene Soulera 5150, Ruben Molina, Ian Pellegrin, Steven Soulero etc. are all very much aware of our 'UK' scene. These are serious collectors who buy, sell and trade with many of us on a regular basis. They've a big event this weekend, a 'show' in Chicago featuring the Southern Soul Spinners which has all the hallmarks of being the US equivalent of Soul Essence / The Jim Wray Lounge, Anthony. The music they collect we might classify as Sweet & Deep and Group Soul - normally extremely rare 45's. Most I've dealt with have fabulous taste in music. Thump records and those CDs are far from the forefront of the scene. The forefront of the scene involves many different series of (bootleg) CDs with rarer and rarer cuts on them. I never understand why people love to call it the "lowrider scene" so much, but I think the new breed of collectors (my age) at least disassociate themselves from the older collectors who want the same played out oldies (sound familiar? ), which to some extent separates them from car shows (although I'm pretty sure car shows are still part of the culture). The newer collectors are also more open minded about sound / tempo and tend to get into some of the same things that the UK "rare soul" scene Djs get into. Also, there is more continuity between other US sweet soul collectors in other cities and the people in California. Also, the California collectors are sort of divided into two camps, the LA-area collectors ("southern souleros") and the collectors around the San Jose area ("northern souleros"). I guested at the last Southern Soulspinners event, in West Covina.....those cats really know their stuff, and it was a joy to get to spin my own batch of obscurities to such a great response! George, Rueben, Arlene, Rene & Jake are the residents behind the Soulspinners events, and they get carefully selected guests to share the music with their big following. I'd say they average around 400 an event and everyone is either dancing, singing along or talking shop about their new discoveries. I haven't ventured up the coast yet to hang out with the Northern Souleros, but I'd love to do that and hook up with Ruben V......it's a breath of fresh air to someone like me that likes hearing and discovering obscure, underplayed soul and not just re-hashing the tried and trusted classics. FYI, although he's a northern soulero, Ruben V doesn't currently live in cali, he lives on the other side of the US. Definitely one of the most knowledgeable collectors on the scene imo. I didn't know that Ruben was no longer up North.....cheers for that, Bob. Very knowledgeable fellow! Growing up in salinas, california I seen this first hand and on the radio. I later became a dj and collecor where I take dedications and requests first hand and undetstand whats goin on. great thread, I've been trtying to find the title of that book for an age. Any boogaloo played as 'lowrider oldies'? my perception of this scene is its mostly based around the sweeter tracks with only the odd deep tracks. its a very good thing IMO a soul scene can exist today that is mainly a younger knowledable crowd. I'm sure I must have exchanged e-mails and bought sold records with some of these people. Yep, mainly Sweet Dylan, then again the likes of Bobby Wade 'Four Walls And one Window' would be right in the groove and they don't get much deeper. Often have it on in the background while working. This one literally blew the roof of the place at the last Soulspinners gig..........huge record. Awesome ! The Step by step album on Brunswick is awesome with at least 5 great tunes !!! Great thread, I've talked to Anthony Sweeney from this site about this music before. I'm really impressed with a lot of what I've heard and the whole sub-culture attached to it is really interesting. might do that,tried to hold this type of stuff back for my own pleasure,dont wanna sell my good stuff just yet. I wonder if I could pull of the look in Nottingham with a big old low rider car and tunes blasting out. Ah, i wasn't sure if you were mixing me up with someone. If anyone has got this book for sale, please PM me with the price. Good feature on this type of Scene in Wax Poetics fanzine - issue 49 - Low Rider Oldies - 14 page spread . Great Poster for a recent event; nothing to do with 'Northern Soul' but check out some of those labels and titles. 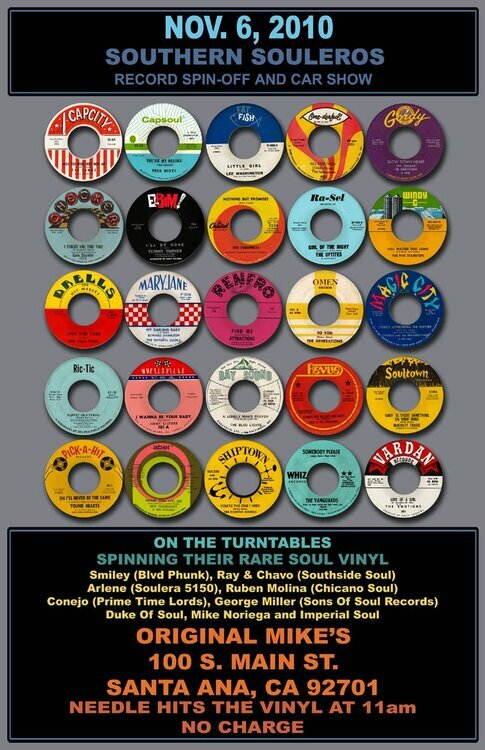 some great soul records there. Thanks! I'll give that a go. Ruben also has a website Sebastian (chicanosoul.com) and I know a while ago he was talking about reprinting the "Old Barrio Guide" but don't know if he ever did. call it lowrider, deep, sweet, group, harmony...whatever you call it, it really is my type of sound when not deejaying. must say I really like their scene and the yway they "do" with tthe music. it really is my type of Soul when not deejaying (and sometimes even when deejaying especially during ea Hip City first`s spot) underline what has been said already, the people I know are all fab! Damn! I live over in Marina. I met the in-Chicago southern souleros today (including Ruben Molina), they were all super nice and friendly. What about the women on the CD covers and youtube clips? Did you meet any of them Bob?